Origen (A.D. 185-254) was notably ahead of the curve, anticipating the later formulations of the Trinity and the divinity of Christ in surprisingly prescient ways. As I prepared for my Early Church Fathers class today I was re-reading Origen's work. I was struck by just how forward-thinking he was. Yes, he had some big problems--we all know about those. But, notwithstanding the more problematic areas of his thought, the truth is, he really was ahead of his time. 1. Origen uses the term "trinity" (τριάς) (In Joh. 10, 39, 270; 6, 33, 166; In Jes. hom. 1,4,1). 2. Origen explains that the Son proceeds from the Father by way of an eternal spiritual act of generation: aeterno ac sempiterna generatio (In Jer. 9,4; De. princ. 1,2,4). 3. 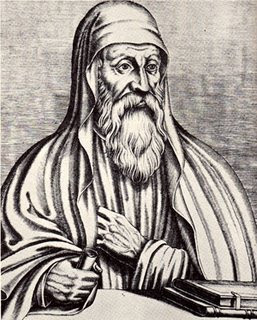 Anticipating Athanasius' refutation of Arias, Origen writes that there was no time when the Son was not (οὐκ ἔστιν ὅτε οὐκ ἦν) (De princ. 1,2,9f; 2; 4,4,1; In Rom. 1,5). 4. Origen writes that Christ's Sonship is by nature, not by adoption (it is not "per adoptionem spiritus filius, sed natura filius" (De princ. 1,2,4). 5. Origen even describes the Son's relation to the Father in terms of unity of substance, that is, homoousios (ὁμοὐσιος) (In Heb. frg. 24, 359). 6. He describes Christ as the "God-Man" (θεάνθρωπος) (De princ. 2,6,3). In addition, consider the following two excerpts. In the first one Origen seems to anticipate the psychological model of the Trinity used by later writers to describe the divine processions. “For if the Son do all those things which the Father does, then, in virtue of the Son doing all things like the Father, is the image of the Father formed in the Son, who is born of Him, like an act of His will proceeding from the mind. And I am therefore of opinion that the will of the Father ought alone to be sufficient for the existence of that which He wishes to exist. For in the exercise of His will He employs no other way than that which is made known by the counsel of His will. And thus also the existence (subsistentia) of the Son is generated by Him. For this point must above all others be maintained by those who allow nothing to be unbegotten, i.e., unborn, save God the Father only. . . As an act of the will proceeds from the understanding, and neither cuts off any part nor is separated or divided from it, so after some such fashion is the Father to be supposed as having begotten the Son, His own image; namely, so that, as He is Himself invisible by nature, He also begat an image that was invisible. For the Son is the Word, and therefore we are not to understand that anything in Him is cognizable by the senses. He is wisdom, and in wisdom there can be no suspicion of anything corporeal. He is the true light, which enlightens every man that cometh into this world; but he has nothing in common with the light of this sun. Our Saviour, therefore, is the image of the invisible God, inasmuch as compared with the Father Himself He is the truth: and as compared with us, to whom He reveals the Father, He is the image by which we come to the knowledge of the Father, whom no one knows save the Son, and he to whom the Son is pleased to reveal Him (De princ. 1,2,6 ANF). Here is Origen coming to the conclusion that the Son is ὁμοὐσιος with the Father. "What else are we to suppose the eternal light is but God the Father, who never so was that, while He was the light, His splendor (Heb 1:3) was not present with Him? Light without splendor is unthinkable. But if this is true, there is never a time when the Son was not the Son. He will be, however, not, as we have described the eternal light, unborn (lest we seem to introduce two principles of light), but, as it were, the splendor of the unbegotten light, with that very light as His beginning and source, born of it indeed, but there was not a time when He was not. "Thus Wisdom, too, since it proceeds from God, is generated out of the divine substance itself. Under the figure of a bodily outflow, nevertheless, it, too, is thus called 'a sort of clean and pure outflow of omnipotent glory' (Wis. 7:25). Both these similes manifestly show the community of substance between Son and Father. For an outflow seems ὁμοὐσιος, i.e., of one substance with that body of which it is the outflow or exhaltation (In Hebr. frg. 24,359). He also thought that Christ was a "second god" or deuteros theos. So, yes very important thinker in may respects but also paved the way for Arianism too! Thank you for a good overview, I used the sources you quoted as a starting point for today's reading of Origen.